I am in the process of building 2 web sites, both of which will require a database program to build forms to collect data and to then build a form to search and return data from the search and display it on web site. I.E., a form to collect information about a property someone wants to advertise and a form for someone looking for property to be able to narrow down the search to, first, a list of all properties that match the search and, second. to desplay a detailed page on one of the properties selected from that list. I have looked at Force/SalesForce and Zoho - both good programs - but can the same end result be done easier with JotForm? First off, I'd like to thank you for taking interest in Jotform. To answer your question, yes it is possible and easy to create a form to collect information with Jotform. Our Form Builder is packed with a lot of features that will outperform our competitors when it comes to form creation. However, upon reading your requirements, I came to the conclusion that what you want to achieve is a full-pledged listing/classifieds platform and while I believe Jotform is one of the best, if not the best, form creators out there, it has limited functions to serve as a listing/classifieds alternative. Hope this post answers your query. Again, thank you for taking interest. Joomla has an extensive directory of plugins. Try searching for a plugin that can serve that purpose. You can now integrate JotForm forms with Salesforce. 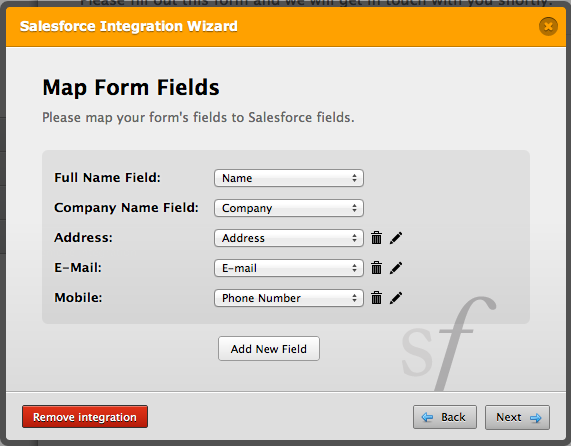 You can even map form fields with your Salesforce lead/contact fields.